The Machias Wild Blueberry Festival is a weekend full of fun for the whole family! The annual Blueberry Festival musical fills the sanctuary of Centre Street Church for five nights of comedy and music. Enter the blueberry pie-eating contest, cooking contest, and road race! 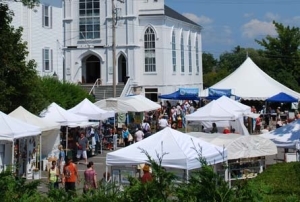 With more than 250 specialty merchants and unique artisans offering Maine-made items and more, the Machias Wild Blueberry Festival is a shopper’s delight! Enjoy some true Downeast fare from lobster rolls to barbecue chicken.